Another one down, and another one down, another one bites the dust. AAAGH!! It happened. I got a Thorny oyster for Christmas and now I think its dead. I fed it well, too(three times a week)! 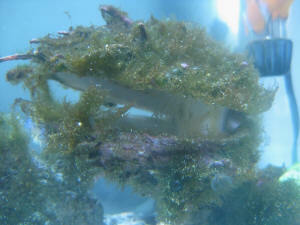 So, I came back from Williamsburg, take a look in the tank, and I see the Thorny oyster, but it looks all shriveled up. I ask my mom and my sister if they saw this, and they said it was fine yesterday! PLEASE HELP ME! Is it dead or alive?! I'll attach a picture. Hello! Long time reader/follower first time emailer! I have a 100 g reef tank. Been established for about a year. Occupants include Purple Tang, Comet Grouper, Blue Velvet Damsel (probably the only non-aggressive of it's species) and a mated pair of ocellaris, 2 coral banded shrimp, 4 brittle stars and one red lip stromb. I purchased a flame scallop 7 month ago and was doing fine. Found it dead and cleaned out last week!. 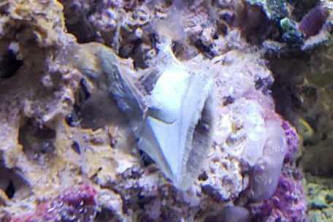 To make things worse this morning I found my blue lightning clam looking unwell. On closer inspection I notices that it appears that something has been eating away at it's foot. I have tried numerous times to get this clam (expensive as it was) to anchor onto a rock but it always moves onto the sand. I have had this clam for over 8 months and with no problems until know. It looks like it's on it's way out! I have a aqua tiger squamosa that I am now really worried about. Help! Pardon my ignorance but what are 'boxers' I assume you mean the coral banded shrimp, which we feed by hand every second day. The stromb we have may or may not be a Strombus gigas, having Googled (or at least the shell is not the same, but the creature inside seems to be the same). 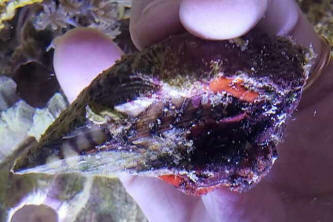 It was sold to us as a Red lipped stromb......fascinating critter! Happy to send a picture if you like!